Our 23rd “Follow them Friday” features HUMID FOODIE blogging in English. My blog used to go by NOLAfoodie, but because another person in New Orleans had the Twitter handle, I was also registered as HumidFoodie on Twitter. After the amazing talk by Alison from Cheeseweb at the first #BxlFF, and a handful of sleepless nights trying to decide how to handle my identity crisis (see what I did there? ), I finally moved over to HumidFoodie officially on all fronts. Clearly, I am a foodie, so that part is easy, but the word Humid comes from the fact that New Orleans (NOLA, for locals) is an incredibly humid place, and you make your plans to go out based on how humid it is, not necessarily on how hot it is. So, it all came together – Humid. Foodie. HumidFoodie. The name of my very first blog post ever? It was on LiveJournal, back in the day, so goodness knows I can’t remember. Our first post on HumidFoodie was “Food Lovers Unite!” and it was a testament to all of my inspirations, my father, my mother, my brother and my sister. But that post was a long time coming, so maybe in reality, it was my first ever real blog post. Yes! There’s no option, is there? YES! I love to eat. I love to cook. I love to wine. I love to dine. I love my friends and my family and taking time to spend time with them, no matter the setting. I love to feed people, and I think that if we wind up at a restaurant, great. If we’re at someone’s home, that’s great, too! I just love to eat and make memories. I don’t like to share. Okay. Okay. What I really mean is chips and dip. Queso, preferably. Anything with cheese in it or on it. Cheese. Did I mention cheese? 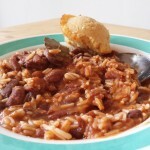 My favorite comfort food is red beans and rice with cornbread, with a touch of pickle juice on top. My father always added pickle juice to the top of his beans, and the memory and tradition lives on. I wrote a blog post all about it, so I won’t go into why here. This one is a no-brainer. I love my eggs scrambled – hard and dry. I don’t like squishy eggs and I don’t like runny eggs. I think it’s something about the texture. I don’t like gooey. I like my eggs firm and fully cooked, easy to eat and they are always the first thing eaten off my plate. Three things in my freezer at all times – ice, ice cream and frozen bananas.